This tutorial on UMTS covers UMTS logical channels, transport channels and physical channels. As shown in the figure, there are three types of UMTS channels viz. 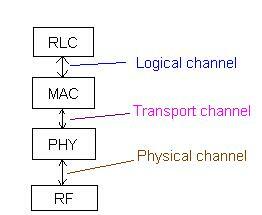 logical channels(RLC layer), transport channels(MAC layer) and physical channels(PHY layer). As they tranverse between layers they map to other layer frames. For example logical channels are mapped to transport channels and transport channels are mapped tp physical channels. 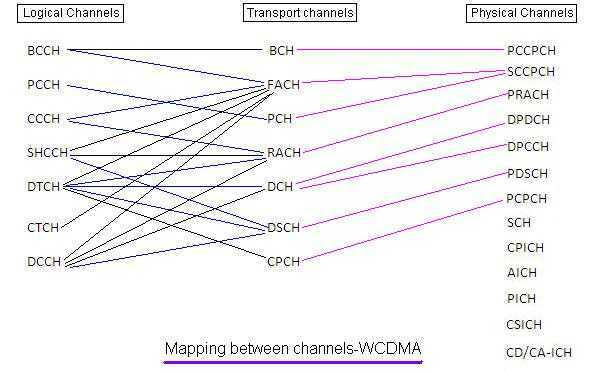 As shown in the figure, UMTS/WCDMA logical channels are divided into control channels and traffic channels(DTCH,CTCH). As the name suggests traffic channels carry information(voice) annd control channels carry signalling information useful to establish and maintain connection between UE and network(NodeB).Following are the functions of each of these logical channels. Pls. note that DL stands for Downlink from network to UE and UL stands for Uplink from UE to Network. DTCH(DL and UL, point to point)- Dedicated Traffic channel,carry user information. CTCH(unidirectional point to multi-point)-Common traffic channel. Following are the transport type of UMTS channels. Following are physical type of UMTS channels for 3.84Mcps case. Following are links to various UMTS channels which cover SCH, SCCPCH, PRACH, PICH, PDSCH, PCPCH, PCCPCH, DPDCH, DPCH, DPCCH, CSICH, CPICH, CD CAICH, AICH channels.